Visiting San Francisco soon? Why not plan your next visit around the Chinese New Year and witness something you may never come across again in your life? San Francisco hosts the largest Chinese New Year parade outside of Asia and a festival that the San Francisco Bay area looks forward to each year with great anticipation. The parade is a visual display of the richness and diversity of the local and regional Asian culture and community. It’s a family affair with parents and elementary school children costumed and organized into representative groups, all marching proudly and happily carrying their decorated banners identifying themselves for all parade observers. The highlights of the parade are the many colorful and well-decorated floats and the exotic dragons which serpentine their way down the street, snaking back and forth to the delight of the crowd along the parade route. All with fierce faces, some dragons’ bodies are supported by glowing lanterns under the flowing silk-like material pushed rhythmically up and down by those working under and inside the bodies of the dragons. As dramatic and terrifying as they may appear, this year I saw a dragon stop to kiss a San Francisco police officer on duty along the parade route. It’s all in the family, certainly within the spirit of community, local friendship, and welcoming in the new year. Parade princesses and local politicians wave and give friendly smiles from atop the back seats of luxury and custom convertibles. An entire college marching band in full dress uniform may stop in front of you and play their rousing “fight” song. 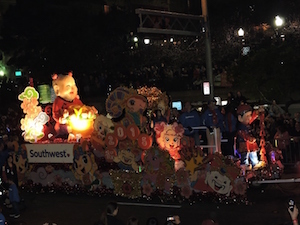 The myriad of floats, some sponsored by large corporations, dazzle and delight with their bright colors and costumed attendants. The firecrackers and fireworks, set off in rapid, earsplitting sequences in the square across from the bleacher seats, were one of the most dynamic and attention-getting activities of the entire parade. In 2016, the Chinese New Year Parade will be held on Saturday, February 20. The parade begins at 5:15 p.m. at Second and Market Streets and ends on Columbus Avenue, where the parade will disperse. Watch the parade by standing curbside on any of the streets along the route. To get the best ringside seats with an excellent view, purchase bleacher seats ahead of time from the Hilton San Francisco Financial District at 750 Kearney Street or online through Groupon.com. The bleachers are assembled the day of the parade just in front of the hotel, in an ideal location toward the end of the parade route, near the judging stands. The Hilton offers a parade package which includes a guaranteed seat and overnight stay at the hotel plus an opportunity to be in the thick of the excitement. The hotel is home to the San Francisco Chinese Cultural Center and hosts many pre- and post-parade parties. 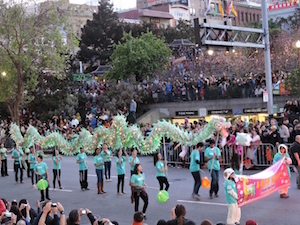 For more information about next year’s parade, visit www.chineseparade.com.